In contrast, however, Researchers at the Tata Institute of Fundamental Research have proposed a theory that predicts how dark matter may be annihilating much more rapidly in the Milky Way, than in smaller or larger galaxies and the early Universe. Anirban Das, with his advisor Dr. Basudeb Dasgupta, pursued this possibility because almost all observations made so far indicate no signals of dark matter annihilation anywhere — except the tantalizing signals from the Milky Way seen by the PAMELA and AMS02 detector and the Fermi gamma ray telescope. If the dark matter origin of these signals stands further scrutiny and signals aren't seen from anywhere except the Milky Way, their theory would explain why the Milky Way appears to be special. 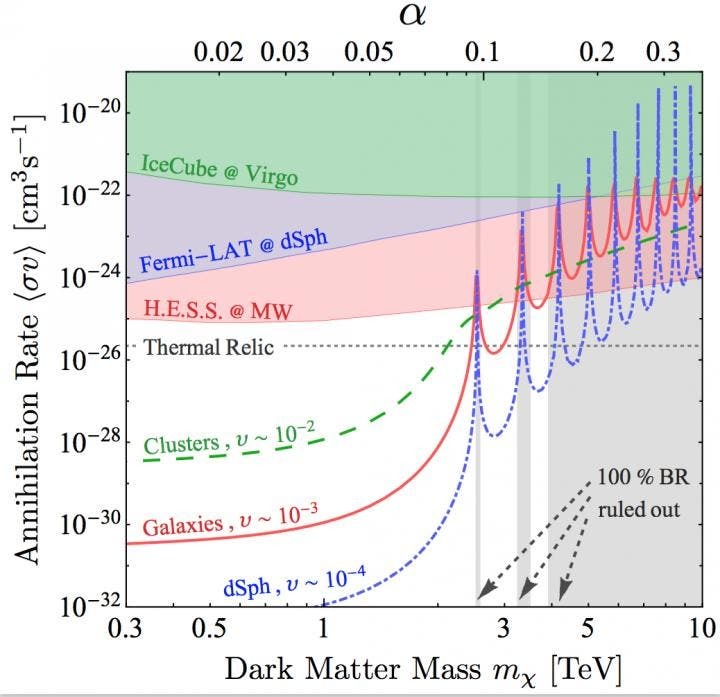 The annihilation rates shown above have a signature non-monotonic velocity dependence over and above the resonances, e.g., for DM mass larger than 4 TeV the galactic annihilation rate (solid line) exceeds that in clusters (dashed line) and dwarf galaxies (dot- dashed line). This new study published in the journal Physical Review Letters on 23rd June 2017, shows that this peculiar behavior of the annihilation rate, in that it is not the same everywhere, stems from the symmetries of the annihilating dark matter particles. Thirty Percent of Stars Have Migrated Across the Milky Way –"Was Our Sun One?" Supernova Explosions Over Millions of Years –"Source of Antimatter in the Milky Way"